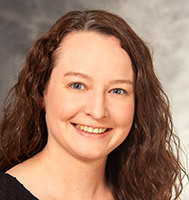 Rebecca is an American Board Certified Prosthetist Orthotist at UW Health. She graduated from the University of Wisconsin-Madison with a Bachelor of Arts degree in East Asian Studies and a certificate in Environmental Sciences. She then attended graduate school at the University of Washington in Seattle, WA, to attain a Master's degree in Prosthetics and Orthotics. Rebecca completed residencies in both orthotics and prosthetics at Scheck and Siress in the Chicago area. Rebecca currently practices orthotics out of Outpatient Orthotics at UW Health at The American Center, and also provides care to inpatients.